On your next camping trip, it’s OK to leave behind the graham crackers, marshmallows and Hershey’s chocolate bars. In fact, you can leave the mountain pie makers in storage, too.I know … visions of Smores have been dancing in your head all winter as you’ve longed to satisfy your sweet tooth while sitting beside a relaxing campfire under a sky filled with countless stars while spring peepers serenade you into a camping stupor. And yes, I know that camping without Smores may seem like going to the movies without popcorn. But there’s no need to fear … eclairs are here. 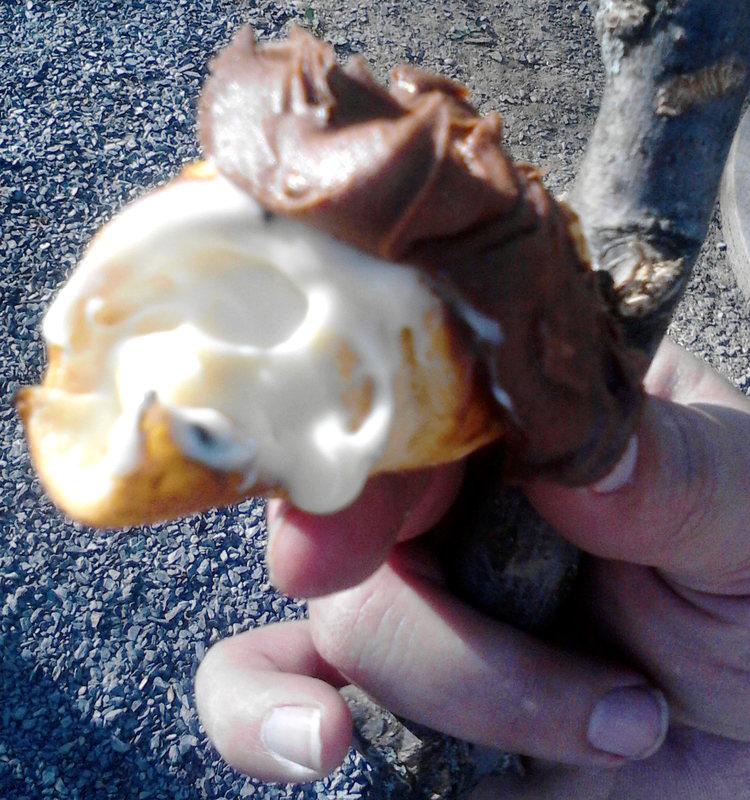 Campfire eclairs, to be more specific. Easy to make and extremely tasty, you’ll be hooked after the first bite. Smores are so yesterday. Eclairs are the snacking future of campfire lovers everywhere. The original idea for this is thanks to my wife’s eagle eye while scanning Pinterest. Three simple ingredients are all that you’ll need. A can of crescent rolls, a pack of pre-made vanilla pudding and chocolate fudge frosting. Our trial run with the campfire eclairs included Hunt’s Snack Pack vanilla pudding and Pillsbury chocolate frosting, but any brand will likely do just fine. The first step is preparing an official eclair stick. 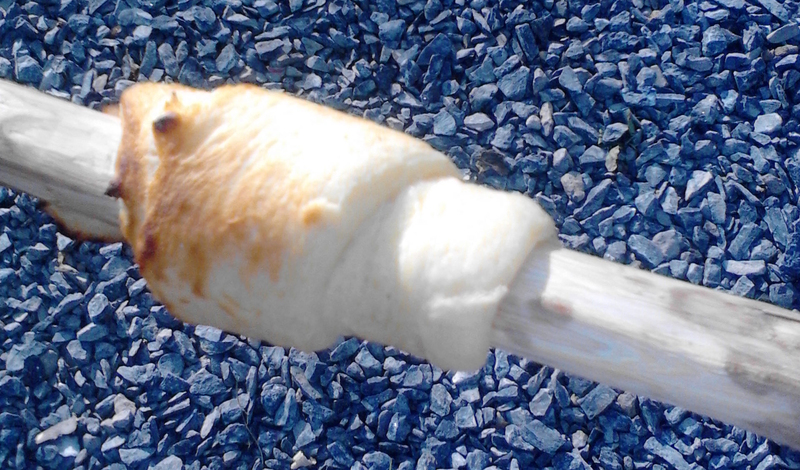 These are thicker than the typical hot dog or marshmallow roasting stick you’re used to. Finding the perfect-sized stick may take some trial and error to suit your needs, but something with a diameter between a quarter and a ritz cracker will do. Once you choose a stick, whittle off the bark at one end, cleaning off any dirt or shavings as you go. As you see with our official eclair stick in the photo above, we cleaned a nice-sized section of stick … about six inches long. Once this is done, you can place the whittled end of your stick in the fire for a minute or so to sterilize it. Once your eclair stick is complete, the rest of the process moves along pretty quickly. 1. Open the can of crescent rolls and take out one triangular piece of dough. Start wrapping it from the smallest end to the biggest around the whittled end of your stick so it looks like the dough in the picture above. 2. Roast the dough-covered end of your stick over the fire safely above the flames. This is something you’ll need to constantly monitor and turn to eliminate burning. Just like roasting the perfectly tanned marshmallow, cooking your eclair isn’t a hard thing to accomplish as long as you pay attention and keep it a safe distance from the flames. 3. Once your crescent roll is golden-brown, pull your stick back from the fire and carefully slide the cooked dough off the end of your eclair stick. The cooked dough should hold its shape and resemble a small burrito shell with a hole in the middle. 4. Quickly pinch off one end to seal it off and spoon/pack as much vanilla pudding as you’d like into the center of your eclair. 5. Smear some chocolate frosting on the top of your eclair to complete the masterpiece. The process is much easier than it sounds and takes only minutes once you have the ingredients prepared and ready for action. Our family’s test run came during a recent trip to camp. Another family met us there and after some campfire tacos, out came the eclair ingredients. It wasn’t long until we knocked off the first can of crescent rolls and had cracked open the second container. Since then, my wife came up with some really cool-sounding variations that we’re anxious to try at some point. Instead of the vanilla pudding, you could easily substitute any of your favorite pie fillings and change the frosting you use on the top to match the occasion. Ultimately, it is OK to break the mold when it comes to campfires and trying new dishes. If you haven’t seen them yet, previous Campfire Cuisine columns includes our new take on campfire tacos and homemade macaroni and cheese. And as I mentioned in each of them, it all starts with building a good cooking campfire. For a step-by-step tutorial on building the best campfire, click here. Let us know if you’ve tried any unique camping dishes. Check back for more Campfire Cuisine experiments in future posts at this blog. ~ by zaktansky on May 16, 2013. This entry was posted on May 16, 2013 at 4:41 pm and is filed under Uncategorized.You can follow any responses to this entry through the RSS 2.0 feed.You can leave a response, or trackback from your own site.